When is the last time you experienced resounding failure? When you really bombed? Remember what you learned from that? Of course you do! See, whether we like it or not, we often learn more from our failures than we do from our successes. Failure underscores the lesson, highlighting it for future reference. It points to areas of growth and opportunities for improvement. Success feels good in the moment, but failure can benefit a person for a lifetime. Still, the mother in me—and the aunt for that matter—hates to see children I love experience the pain of disappointment. I’ve seen it plenty of times though. Here are just three of examples. My oldest, an 8th grader at the time, had spent months preparing her History Day project on Eleanor Roosevelt, chair of the United Nation’s Human Rights Initiative. The topic was complicated (it took me awhile to understand it myself). She’d done fastidious research, using mainly primary documents. She compiled her sources in an annotated bibliography and wrote a script which she committed to memory. She also created a backdrop, pulled together a costume, and collected vintage props. After a successful district performance, she headed to the state competition with high hopes. The results? She lost to a student whose mother had admitted to me that she wrote most of her daughter’s script. It seemed as if my son only got on losing teams. Whether it was little league baseball or church basketball, more often than not, his team would lose. No one played harder, practiced more intently, or came to games more prepared. Regardless, game after game, his teams fell short of the mark. When she was in the 6th grade, my youngest daughter challenged a teacher. It’s a long and complicated story (believe me when I tell you that you do not want me to get started on it). The short version is that the teacher was about to read aloud from a popular trade paperback (not a classic by anyone’s appraisal) that I had not allowed my kids to read due to the mature content. My daughter asked to be excused to another room. This launched a controversy that led to a number of lengthy emails that flew between the teacher and me over the course of several days. Suffice to say, we disagreed in the extreme. Shortly after that, grades were due. My daughter had an A average, but her participation grade dropped suddenly and she wound up with a B in the class. She was beyond furious. In each case, though, my children learned more from these failures than they ever would have from succeeding in the same situation. My oldest learned that careful research is actually its own reward, no matter what an impartial judge may say. My son has developed persistence that is unrivaled; loss never diminishes his resolve. My youngest, still spunky and opinionated, discovered that true conviction is more important than academic assessment. None of those valuable life lessons could have been acquired through success. It took failure to teach them the hard lessons. Knowing this does not mean I want my kids to fail. I don’t. I never celebrate when my beloveds fall short of their objectives. 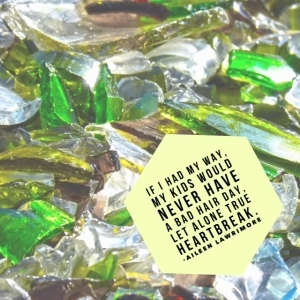 (Frankly, if I had my way, my kids would never even have a bad hair day, let alone a true heartbreak.) When things don’t go their way, I grieve with them and share their disappointment. But over time, as tears dry up and emotions settle, I do my best to uncover the blessing in the setback. And it’s always there. Always. Tempted to give advice? Don't. Depression: 6 bits of unwanted advice and my (unspoken) responses. You are so wise, dear friend!! And a gifted writer! Thanks Ellen! I always value your thoughts and opinions!